Useful information about the ocean can be derived from both forward and inverse applications of underwater sound. Direct methods include traditional sonar applications. Inverse methods extract information from direct measurements of the physical properties of the ocean. These inverse methods combine direct physical measurements with theoretical models of underwater acoustics. The objective is to estimate detailed underwater acoustic fields from sparse physical measurements using the theoretical models as guides. Inverse sensing techniques that employ acoustics have been used in several sub-disciplines of geophysics including seismology, meteorology and oceanography. Seismologists have used tomographic techniques to infer the bulk properties of the lithosphere (e.g. Menke, 1989). Atmospheric scientists have employed naturally generated, low-frequency sound (microbaroms) to probe the upper layers of the atmosphere in an inverse fashion (Donn and Rind, 1971); Coulter and Kallistratova (1999) discussed acoustic remote sensing of the lower atmosphere. In oceanography, inverse acoustic data provide estimates of spatially integrated and temporally averaged oceanic conditions that are not readily available from a traditional constellation of point sensors (e.g. Bennett, 1992). 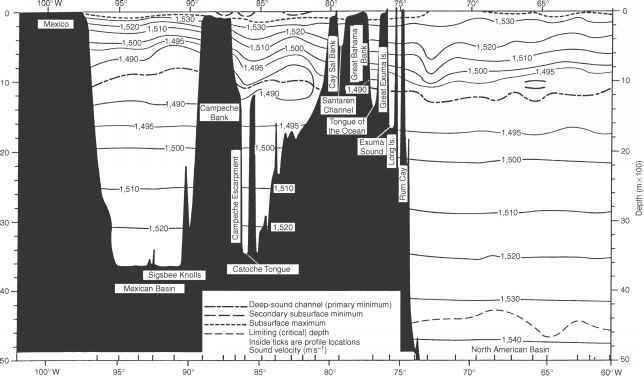 Collins and Kuperman (1994b) presented a broad discussion of inverse problems in ocean acoustics and methods for solving them. Parameters of interest included sound speed in the water column, sediment properties and boundary roughness. The importance of forward models in solving inverse problems was stressed. Diachok et al. (1995) documented the proceedings of a conference on full-field inversion methods in ocean and seismo-acoustics, which was sponsored by the NATO SACLANT Undersea Research Centre in Italy in June 1994. At this conference, it was demonstrated that inversion methods could exploit the amplitude and phase information detected on hydrophone arrays or geophone arrays to infer environmental information about the ocean. Furthermore, proceedings of an international workshop on Tomography and Acoustics: Recent Developments and Methods (University of Leipzig, March 2001) were documented in a special issue of the Journal of the European Acoustics Association (ACUSTICA acta acustica, Vol. 87, No. 6, 2001). This two-day workshop addressed tomography, acoustics, atmosphere applications and ocean applications. Inverse acoustic sensing of the oceans utilizes one of three natural phenomena: propagation, noise or reverberation. Table 1.2 summarizes selected inverse ocean acoustic sensing techniques according to the natural phenomenon utilized. The specific techniques identified in Table 1.2 will be discussed below and in appropriate sections throughout this book. Field inversion • sea-floor imaging that addressed a wide spectrum of inverse problems in underwater acoustics including estimation of geoacoustic parameters, acoustic thermometry and shallow-water characterization. Inverse acoustic sensing methods utilizing the propagation characteristics of the oceans include matched field processing, ocean acoustic tomography and deductive geoacoustic inversion (see Chapter 5). The ambient noise field in the oceans is described by the spectral, spatial and temporal characteristics of sound generated by both natural and industrial sources. Measurements of these characteristics can provide useful information regarding the nature of the noise sources themselves as well as physical features within the oceans. Examples of inverse applications of the noise field include wind speed determination, rainfall measurements, object imaging ("acoustic daylight") and geoacoustic inversion (see Chapter 6). The reverberation field in the oceans is the product of acoustic scattering by the surface and bottom boundaries, and by inhomogeneities within the oceans. The utility of the reverberation field as an inverse sensing technique is analogous to that of the ambient noise field. For example, the reverberation field can be inverted to image the sea floor (see Chapter 8). Inverse acoustic sensing techniques presently constitute adjuncts to direct measurement methods. However, the application of inverse acoustic sensing techniques to dynamical studies of the oceans' boundaries and interior show great promise for three reasons. First, such data can be used to establish comparative baselines for other remote sensors, such as satellites, by providing synoptic portraitures of the interior oceans together with concurrent groundtruth data at the sea surface. Second, inverse acoustic techniques often afford useful insights into a broad class of oceanic phenomena since their successful employment relies heavily on the use of numerical models first to understand the role of the oceans as an acoustic medium. Third, inverse data provide estimates of spatially integrated and temporally averaged oceanic conditions that are not readily available from traditional oceanographic sensors.